Some of you may have seen our rack card that we use to advertise our flights. On the back is a picture of Katharine Board, pilot and Flight Attendant Carole Stedman. 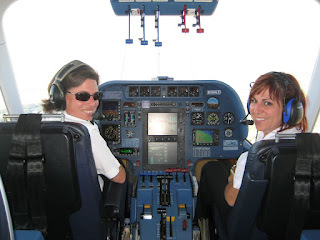 We get many positive comments on the sunny smiles coming from the cockpit in that photo, so yesterday I asked the ladies to reprise it for me! Picture perfect!